An expert on turning change into opportunities and transforming cultures, speaker Adam Markel empowers high achievers and inspires his audience to reinvent themselves. 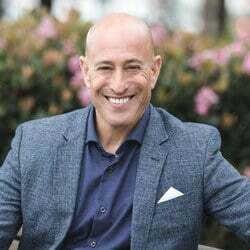 Adam is a sought-after speaker who has shared the stage with Tony Robbins and is also bestselling author of Pivot:The Art and Science of Reinventing Your Career and Life. Keynote speaker Adam Markel has a BA in English and started his career as a public school teacher but quickly delved into the business world. Since then, he has invested in a variety of organizations and founded multiple successful business like a multi-million dollar law firm. Adam’s experience in business is diverse and extensive and he has proved again and again how his ways and methods create sustainable success. As a successful entrepreneur, Adam Markel knows the challenges that come with started a business. He has had multiple top positions and was recently the CEO of North America’s biggest human potential company. Today, he is the proud co-founder of More Love Media. Adam is on a mission to help people create transformation and change in their life in a way that . His approach is rooted in a belief of never ending self-development and leading from his heart. Speaker Adam Markel is the author of the bestseller Pivot:The Art and Science of Reinventing Your Career and Life in which he introduces his pivot principles which provide a guide for entrepreneurs and corporate professionals for developing skills and capabilities to achieve success in their work life and private life. Everything we do and everything that happens is a result of this constant disruption and change happening in the world. We must be able to reinvent or “pivot” quickly to achieve our goals and success in the long haul. This is what Adam is an absolute expert in. As a speaker Adam Markel is engaging and dynamic. He is known as one of the most charismatic speakers out there and his global experience makes any keynote a powerful experience for everyone. His unique keynotes provide a bridge between self-development and business mastery that guide people to achieve greater achievements through constant awareness and authenticity. Adam provides practical tools and skills that ensure his audience know exactly what changes to make to achieve sustainable success. Have you ever wished you could make a significant change in your life or career, but you’ve been uncertain how to begin, or how to handle the risk? In this dynamic keynote Adam presents his very best advice to pivot your way to the top of your career or business. Learn the 3 ingredients to creating a successful pivot and the 5 principles of momentum: how to create and sustain! This keynote is designed to instruct and explore how to create exponentially better sales results by opening and maintaining better relationships. Stress is a major factor in organizational failures. It affects everything from decision-making capability, to employee turnover and the bottomline. With this ever present level of stress, it’s vital that leaders develop the ability to not only perform under stress, but to thrive in the face of it. In this engaging and experiential keynote talk, Adam will share the critical factors necessary in building high performance capacity and resilience. Understand the fine distinction between success, failure and burnout, including strategies to handle each. Learn the important difference between success habits and Master Habits and how to build them as well as 3 strategies for utilizing stress to maximize team performance.